PHILADELPHIA, PA –June 2, 2016 – Janney Montgomery Scott announced today the hiring of two senior sales professionals to join their New York Institutional Equity Sales team. Andy Ballou and Glenn Skolnick have joined the firm as Managing Directors and will report to Andrew Maddaloni, Director of Research and Head of Equity Sales. Mr. Ballou joins Janney from RBC Capital Markets, where he spent the past 14 years in Institutional Equity Sales covering long-only and hedge fund accounts in New York and Connecticut. Prior to RBC, Andy spent time in Equity Research at CIBC and Credit Suisse, having started his career at Merrill Lynch. Mr. Ballou has an undergraduate degree from Hampden–Sydney College. 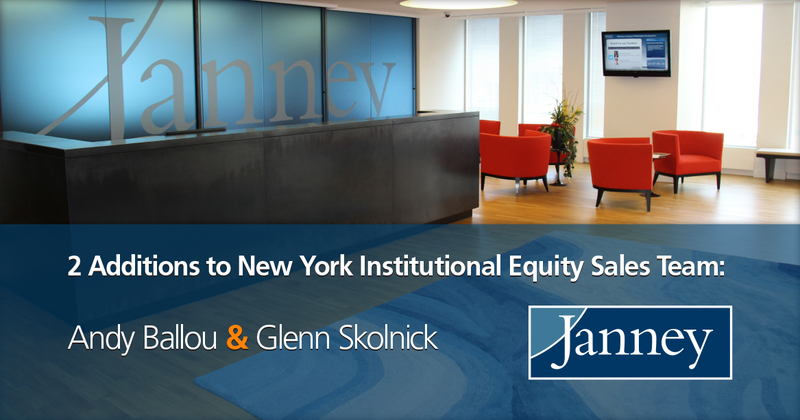 Mr. Skolnick, with over 20 years of industry experience, comes to Janney from BMO Capital Markets, where he spent the previous five years as a senior Institutional Sales professional covering New York hedge fund and long-only accounts. Prior to BMO, Glenn was a senior salesperson at Morgan Keegan, WR Hambrecht and Wachovia. Mr. Skolnick began his career in Equity Research at Bear Stearns and earned an undergraduate degree from Cornell University.